Fifth N' Sixth's Closet: They don’t make ‘em like this anymore! They don’t make ‘em like this anymore! Suit: vintage, Shoes: Old MIA, purse: BCBG, watch: Moschino, Jewerly: Macys, Vintage, & c/o mom, lipstick: Chanel boy. Jeans: Seven for all mankind, Blouse: Thrifted, Shoes: Steve madden, Bisola’s purse, Belt & watch lil sis, jewelry: Flea market & Vintage. Hello, girls. You are absolutely amazing today. Love the suit, pants and shirt. Xoxo. I love your outfit, they are classy and stunning! Two different syles yet both classy!! I am loving the blouse and the suit! You both look so Fab! You are right.. they don't make em like that anymore, great suit and texture/color. I love those jeans and that green handbag!! Yet another A+ outfit! I I am adoring those handbags too! Great outfits on both of you!! I gave you a fun little blogger award. I hope you visit my blog and play along! Thanks! Cute sweeties! Bisola that suit is a fab find. 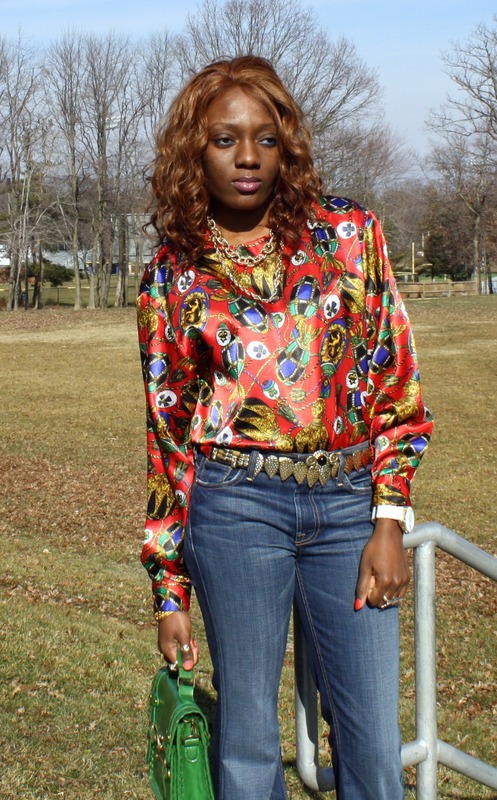 Dammie Gee I'm loving your hair and those bell bottoms....HAUTE! I love both looks! The suit is amazing, very 80s vintage hot looking. The blouse is stunning too and how gorgeous is Mom's mint green bag!!! You both look gorgeous !! I love the dress , so chic & classic !! Thanks for comment on my blog, hope to see you back soon. amazing outfits!! You both looks great! Gorgeous outfits! Loving the colors! Fabulous suit and beautiful blouse!!! You both look gorgeous <3 I cannot get enough of your blog! Great thrifted, print blouse! That's a nice pop in the winter! Ladies, I love the suit but the vintage denim outfit is everything to me right now! No, they sure don't ;) Both looks are phenomenal! So my kind of style! Ok, that vintage suit is amazing! And I love those flare jeans! Thanks to everyone for the lovely comments! Such a pretty women!! Love it! The 80s top and the suit are awesome! Actually you guys are always so elegant! Such great looks- both of you! the red blouse is a w e s o m e !! and so is your header!! PRINTS ARE HUGE TREND now :))) Thks for ur love..u Both are just amazingly sweet. Gorgeous as always. Have a great weekend my darlings!! I LOVE vintage clothing, and you both look so fabulous! I also love both of your satchels! just discovered your blog and am loving it!! i love your use of color and they way you coordinate with each other... but subtly!! 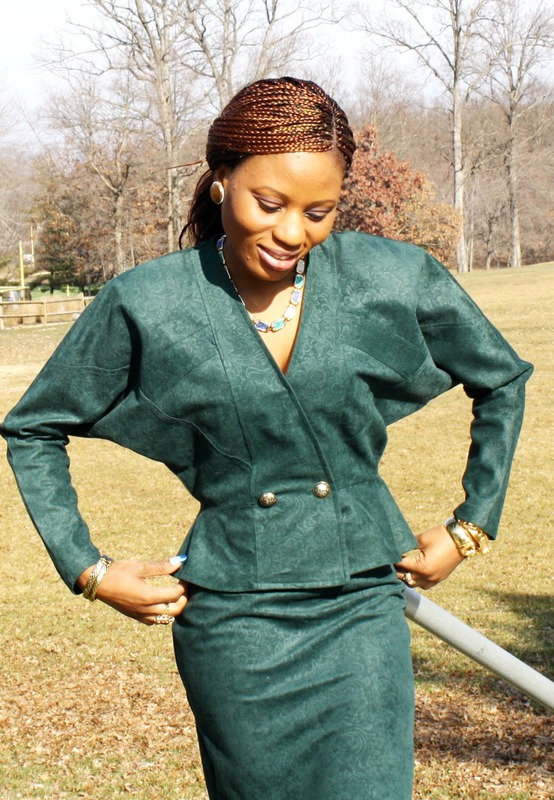 The green suit is such a classic look and flared jeans are so flattering and stylish. I love your handbags too! Ahh the jeans! I love everything about them, the cut, length, style, everything!